You can use NetworkManager to create an InfiniBand connection. 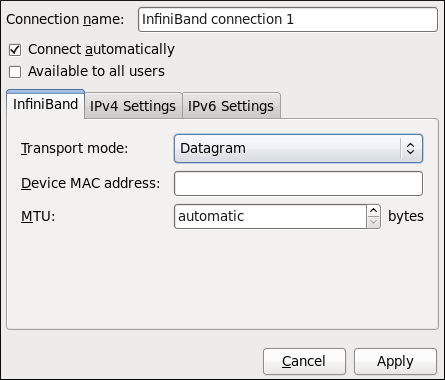 You can configure an InfiniBand connection by opening the Network Connections window, clicking Add, and selecting InfiniBand from the list. Click the Add button to open the selection list. Select InfiniBand and then click Create. The Editing InfiniBand Connection 1 window appears. On the InfiniBand tab, select the transport mode from the drop-down list you want to use for the InfiniBand connection. Enter the InfiniBand MAC address. Edit the InfiniBand-specific settings by referring to the Configuring the InfiniBand Tab description below . Follow these steps to edit an existing InfiniBand connection. Connection name — Enter a descriptive name for your network connection. This name will be used to list this connection in the InfiniBand section of the Network Connections window. Once you have finished editing your InfiniBand connection, click the Apply button and NetworkManager will immediately save your customized configuration. Given a correct configuration, you can connect to your new or customized connection by selecting it from the NetworkManager Notification Area applet. See Section 10.2.1, “Connecting to a Network” for information on using your new or altered connection. If you have already added a new InfiniBand connection (see Procedure 10.13, “Adding a New InfiniBand Connection” for instructions), you can edit the InfiniBand tab to set the parent interface and the InfiniBand ID. Datagram or Connected mode can be selected from the drop-down list. Select the same mode the rest of your IPoIB network is using. The MAC address of the InfiniBand capable device to be used for the InfiniBand network traffic.This hardware address field will be pre-filled if you have InfiniBand hardware installed. Optionally sets a Maximum Transmission Unit (MTU) size to be used for packets to be sent over the InfiniBand connection.